Sitting here in the press box at the Runway, about an hour before game time. Looks like the Husky Walk was a flop. I was walking around for 10 minutes looking for it, along with a handful of parents with young kids, and when we got to Gate D at 5 p.m. sharp, we were told it was over. We'll cut them some slack since this was the first try, but there's some kinks that need to be worked out. What did you all think about the walk? Figure out which UConn player the youngster was in this picture from on the previous post? It's none other than Rob Lunn at age 2 1/2. Thanks to Rob's dad, Bob, for the picture. 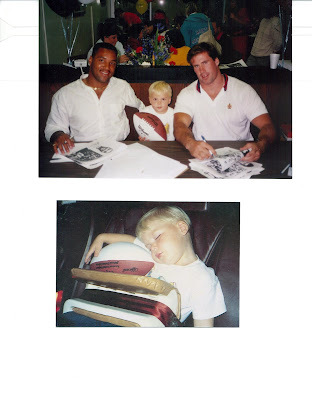 The picture was taken at a Buffalo Bills event in upstate New York circa 1988, and the two guys alongside young Rob are star linebackers Cornelius Bennett and Shane Conlan. Apparently, the excitement knocked little Rob out and he passed out, ball in his clutches, on the ride home. The photo was part of a feature I wrote on Rob that appeared in Friday's Register. Unfortunately, it didn't appear on our website, but I'm working on it. Rob's dad is a New York State Supreme Court justice, and Rob talked about an assortment of topics including growing up..."Needless to say, I didn't win many arguments," he said. ... his recruitment (he committed to William & Mary before visiting UConn, then changed his mind) and evolution into a starter for the Huskies .... and his future aspirations. Rob isn't thinking about following dad's footsteps into judgeship, but plans to attend law school to study contract law and become a sports agent. I am working to get the story online soon. That's it for now. Maybe some postgame notes. I think the Husky Walk is a great idea, but they definitely need to work out the kinks. I walked to the stadium from Red Lot and got there just before 5 o'clock only to hear a father telling his son that they missed the walk. I was bummed out, especially since I had to walk all the way back to Red Lot. It was a wasted trip from Red Lot to the stadium. That's ok, at least they had some cold ones waiting for me when I got back to the tailgate.